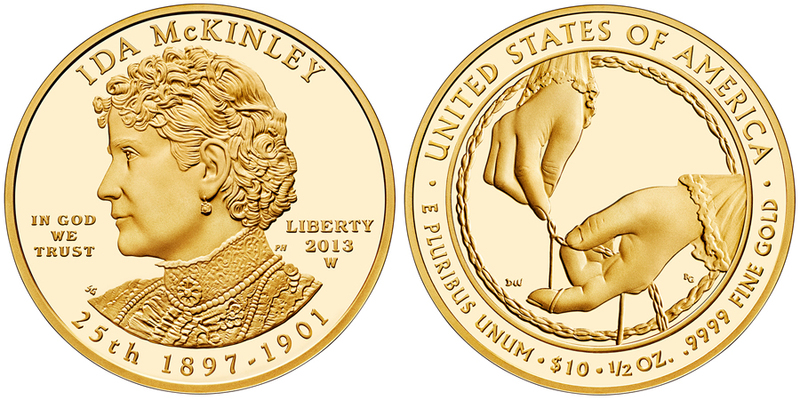 The 2013 Ida McKinley First Spouse Gold Coin is offered by the United States Mint as the first of five 2013-dated strikes of the First Spouse Gold Coin Program. Each of these coins, like all others in the series, will be struck to either proof or uncirculated condition from 1/2 ounce of .9999 fine gold. Coins of this series honor the spouses of the former Presidents of the United States. In this case, the coin honors Ida McKinley, wife of William McKinley, the 25th President of the United States who served in office from March 4, 1897 through September 14, 1901. This series debuted in 2007 with a coin honoring Martha Washington, wife of George Washington, the first President. The series has then featured twenty-five other coins honoring the spouses in the order in which their husbands served. Typically, the release rate is four per year which is the same as the related Presidential $1 Coins. However, if a president had more than one spouse while in office, both are honored by individual coins. This was the case in 2009 when both Letitia and Julia Tyler were honored on separate coins. Ida McKinley had been an invalid for several years before she became the First Lady. As such, she occupied most of her time in the White House with her hobbies as the Vice President's wife fulfilled most of the social obligations of the First Lady. Shown on the obverse of the coin is a portrait of Ida McKinley. Inscriptions on the obverse include IDA MCKINLEY, IN GOD WE TRUST, LIBERTY, 2013, 25TH and 1897-1901. The reverse of the coin contains a scene emblematic of the life of Ida. Reverse inscriptions include "UNITED STATES OF AMERICA", "E PLURIBUS UNUM", "$10", "1/2 OZ. ", and ".9999 PURE GOLD.